On August 12, 2016, Community Broadband Networks initiative director Christopher Mitchell was interviewed by Mike McIntee of AM950 in Minnesota. Download or listen to the audio file and you can find a transcript below. Mike McIntee: Hey welcome back, it’s Mike McIntee here with you on the 4:30 to 5:00 part of the show. I am so glad that you could join us today, 952-946-6205’s the number we’re taking your phone calls at. You may want to join in this next conversation that we’re going to have because we’re going to talk about something that every one of us has to deal with everyday, because you know what, the internet has become a utility, just like electricity, just like water, just like sewer. Some people would say the internet is a sewer, it depends on what the content is. You use it every day, you rely on it, you expect it to be there, and you probably have to buy it from one provider. You might have two in town, but boy it costs a lot, it’s frustrating, it’s not as fast you want, and that’s a problem because there’s not a lot of competition. Now cities have been talking about getting into this business, and some cities have. Where they start providing their own internet and in some cases, we just did a story earlier this week I believe in Minnesota, where in Minnesota some of the farm communities have been banding together not because there’s bad internet but because there’s no internet. They’ve been building their own internet companies out there. It’s working, it’s faster than what you have probably, unless you’ve got some super fast connection. There are other ways, other than Comcast, although Comcast and some of the telephone companies probably don’t want you to think about that, probably don’t want the competition. That has been a problem because certain groups, ALEC, have been lobbying to stop this in other states, and in fact they have. They have managed to get laws passed that say, “You know what cities? You cannot. You cannot get into the business of internet because Comcast is going to make that money, not you.” Yeah, that’s what’s happened. It has not happened here in Minnesota but it is potential, it is a problem across the country. We’ve invited the director of the Community Broadband Networks Initiative at the Institute for Local Self-Reliance, who needs to get a shorter title I think for everything, Christopher Mitchell to join us. Christopher welcome to the program. Chris Mitchell: Thank you. The title’s been a problem for a lot of years. Mike McIntee: How do you fit that on a business card? Mike McIntee: Multiple lines. Let’s talk about the issue here, which is, I get frustrated because I have Comcast, I have a phone company I can buy stuff from and I would like my city of Eagan to get into the business of doing their own internet. In fact they have for some business in Eagan. Mike McIntee: It’s really high speed but it’s only in certain areas. It’s because it costs money to build that infrastructure, but that’s what the government, it builds on infrastructures. A very general question, why isn’t the government building out infrastructure and doing this when they should be the utility doing this? Chris Mitchell: I think a lot of local governments are trying to figure out the right role. You were going through a couple of different things even in your introduction. Some cities are basically becoming like Comcast, I’d like to think that they are Comcast but with good services, low prices and all the other things that we don’t get from Comcast, but they offer the same services effectively in terms of internet, television, telephone. Other local governments they’re thinking, “You know what? We want to put in some lines to our business,” like Eagan has done. Other governments are thinking, “We’re going to put in some infrastructure and we’re going to lease it out to other providers to use.” Usually local providers that have a good customer service, not the big companies like Comcast and CenturyLink. There’s a variety of approaches but the number one reason that I’d say most local governments don’t do it is because they’re scared. They’re a little bit afraid of what might happen in terms of if Comcast or CenturyLink were to sue them, challenge them in some way. They’re also afraid that they might not to do a good job at it. I think that’s reasonable, this is a challenge and I don’t want to minimize it. There is some honest apprehension in terms of, it’s a difficult job to do. I think local governments are stepping up more and I think people need to demand that their local governments at least examine the possibility. Mike McIntee: Is it working in places? You said local governments are hesitant to jump into it, so I’m sure one of the things that makes them hesitant is they don’t see examples, or lots of examples, of local governments that have gotten into this and made it work. Have there been example where it works, or examples where it’s gone horribly wrong? Chris Mitchell: Both. More examples where it works though fortunately. 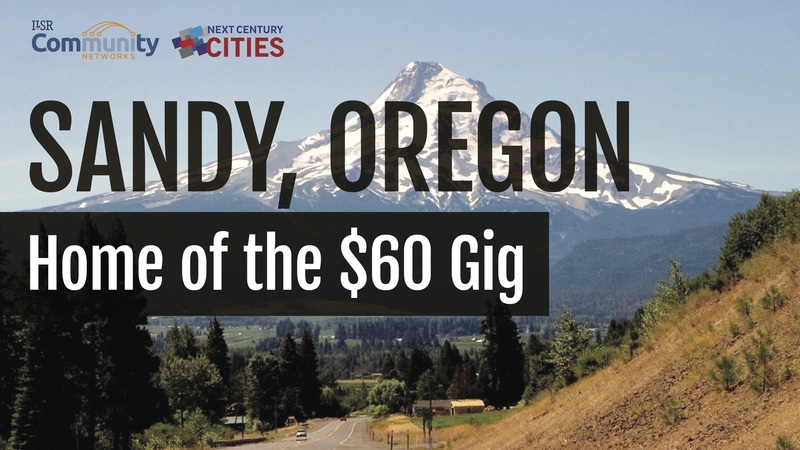 We’re tracking over four hundred and fifty communities where local governments have done something in terms of wired, usually fiber optic, internet access. About a hundred and fifty of those are city wide. Most of those are successes. Cedar Falls, Iowa has, I think it’s nine out of ten people in Cedar Falls choose not to connect from CenturyLink, not from Mediacom, but they want to get services from the municipal utility the city has. They were the first city in Wisconsin to have a gigabit available to any address. They’ve been doing it for twenty years. They have an incredible record of success. Chattanooga is the poster for success. Twenty three million dollars extra last year I think when you subtract the cost and debt from the revenues. Some of these networks have incredible successes. The most common example though is actually one where the network just pays these bills year to year, doesn’t really have any profits. They offer some competition so prices are lower to people in the community, and more importantly for some jobs are able to stick around because they can get those connections that they need. Then we have a few examples of communities where it didn’t work out the way they expected. There are some, you might say failures, and there are some that are hard to categorize. Monticello, Minnesota, forty five minutes out ninety four from Minneapolis. They built a network and they went from having some of the worse connectivity in the state, they had basic broadband just barely. They had something but it wasn’t good, and now they have some of the best. They get better access than I can in St. Paul, you could in Eagan. They pay a lot less than we do, but the network hasn’t broken even financially. They’ve had to subsidize it with funds from the liquor store, that’s not ideal. It’s not what they wanted. They had to give their bond holders a haircut, which is unfortunate for the bond holders certainly, although those bond holders took that risk knowing it, offered a higher interest rate for my friends out there who are really geeky about this. It’s not too unexpected when you have a higher risk bond that you face some challenges. I would say the spectrum right there. You have cities that, a few haven’t done the best job, they’re trying to figure out how to make it, turn it around. Our electric utilities are a hundred and twenty years old, the network in Monticello is six or seven years old. In another fifteen or twenty years I think people might never even know that Monticello had trouble, but it’s a warning sign. In any local government that thinks about doing this lobbyist from the cable and telephone companies, they’re saying, “No, you don’t want to be another Monticello.” You look at the paper, the Rochester Post Bulletin, an op-ed was just published by the telephone companies’ lobbying group saying, “Oh no, if Rochester wants to do anything on municipal broadband it would be a disaster. The city would be … Locus and plagues would come to it.” That’s what happens. Mike McIntee: I look at what I get from … Okay, let’s say I’m … Let’s stick with the business because they’ve been around, they’re working right now. I can hear that argument, but I look at it also and I say, “I’m paying A, a lot of money. B, the service I know is slower here than some of the places you just mentioned,” and practically any civilized nation in the world now has faster internet than I do in Eagan, Minnesota because that’s the way it’s been built out, it’s been developed. They’ve invested in infrastructure, it’s looked at as a utility. In terms of speed, in terms of price it gets beaten. I know whatever it is I’d have to deal with is probably better than what I deal with with Comcast because it is rated the lowest of any company in terms of customer service. I think you’ve answered but, why did we end up with companies like this running this instead of the government getting into it? Chris Mitchell: It’s a really good question and I actually think that there’s a happy medium, in that the government decided more than twenty years ago, twenty five years ago maybe, that it wanted to commercialize the internet. They wanted private entities to help build it out, and I think that was the right decision. Now I think government can actually build it out at the same time, kind of in the same way that we can have private taxis and public buses on our roads. It’s not an either/or proposition. The problem is that you have a service here, and it’s what we call a natural monopoly, or it has characteristics of a natural monopoly. Which is to say if you and I wanted to build a network, we wanted to compete with Comcast in Eagan, we’d have to raise more than ten million dollars. I don’t know exactly what the number might be but let’s say it might be twenty or thirty million dollars. Now, who’s going to lend that money to us? Mike McIntee: Not me, I don’t have it. Chris Mitchell: Which is thinking, “Comcast is going to beat you guys up, Comcast can lower their prices.” Even though the service won’t be as good people are going to with the lower price. A company like Comcast that’s been around forever, it’s so big, they can take losses year after year. That’s actually what we saw in Monticello, where Charter lowered their price so much, they were willing to lose money year after year on every customer that took their deals just to try and hurt the municipal network and drive it out of business. That’s how we ended up here. The challenge is I think where do we go next? Eagan is smart, Eagan is building some fiber. I think people like you would like it be more aggressive, and if enough people tell their city council maybe it will be more aggressive, but at least their doing something. Mike McIntee: I better see my mayor tonight. I’ll call him up. Chris Mitchell: In St. Paul they’re doing nothing and it’s driving us nuts. They’re throwing money at Comcast to connect the schools, the libraries, all that. Not the schools, but the libraries, the police stations, the municipal facilities. We’re paying Comcast all kinds of money for this cruddy connection when we should be investing in fiber. Maybe not aggressively but certainly putting a little bit of fiber in the ground when we can at the bare minimum and trying to figure out how to build this over time. Mike McIntee: Let’s talk about the thing that prompted this whole conversation that we’re going to have today, which is what the court ruled on the FCC’s attempt here to say that cities can go ahead and do this despite what state rules say, what state laws say. A lot of those laws that have been passed in North Carolina and Tennessee have come from ALEC I believe. Mike McIntee: Basically this is large business funding government to say, “Don’t pass laws that are going to cause us to lose money.” How did that all happen? What does this ruling mean for states that want to have their own local control over internet? Chris Mitchell: I don’t think this has a big impact outside of North Carolina and Tennessee to start off with. Basically what happened was you have North Carolina and Tennessee years ago passing these laws at the behalf of the telephone and cable companies that wrote them. At that time the newspapers didn’t really run stories about it, the radio talk shows didn’t talk about it, so they went through in secret more or less. That was how they got through. Since then we haven’t really seen new laws like that getting through because it’s enough of a big deal now that light is shined on it, and then the elected officials who have been taking all this money from the cable and telephone companies and passing these laws, most of them get embarrassed, some of them get indignant. We’re not as worried about it continuing, but those laws are still there. Trying to reverse them is incredibly difficult because … Tennessee we tried to reverse this, I was just a small part in terms of observing it, but a group of people’s been fighting for years, grassroots organizing. They lost a committee vote five to three, and I believe the newspaper said there was twenty six lobbyist in the room from Comcast and AT&T, for a five to three committee vote. They can [muster 00:12:40] those kinds of resources to get out there and protect these terrible laws. Other states will continue working with the legislature to get them to understand that these barriers are bad. The twenty-some states that have them would like to roll them back. The one thing I’d like to note is Minnesota actually does have one of these. It wasn’t an ALEC rule, but it was passed in 1915 and it has to do with the telephone switch. The way it’s written, it’s opaque but it’s convinced a lot of cities that they cannot do this without passing a two thirds, or sixty five percent, referendum. That has stopped communities, especially in more rural areas where you need the telephone service. In the Twin Cities if you were to build a fiber and cable service you could probably make that work in the right conditions, but out of here if you’re in the Greater Minnesota it’s hard to figure out to make a service that doesn’t have telephone built into it. That referendum’s hard because the cable and telephone lobbyist, they just have to spend tens of thousands, hundreds of thousands of dollars to convince thirty six percent of the people to vote against it. That’s a really big hurdle. Mike McIntee: That is a big hurdle. Are there any other attempts in Minnesota to pass dumb laws, or is the telephone law enough that the whole telco cartel is happy with what we have? Chris Mitchell: Every time there’s an effort Minnesota League of Cities and a number of elected officials push back and try to get that law changed so that there would be no supermajority referendum requirement. That’s when it comes in. The cable and telephone companies, the big ones in particular, they really work hard to make sure that it doesn’t. What would happen is that we would say, “Let’s get rid of that provision,” and the cable and telephone lobbyist would counter with, “Okay, if you’re given them something we’ve got to get something. We want to have a referendum requirement that’s fifty percent but we also want to have these other three kickers in there that are going to make it really hard to build networks. From our point of view we’d rather have bad legislation, bad laws, that we’re used to, rather than new things that they might come up with. Mike McIntee: The devil I know. Chris Mitchell: The other thing is that when you look at the money that was set aside to expand rural internet access, the thirty, thirty five million that was set aside this year. Boy, Comcast was the number one lobbyist on that issue, despite the fact that they can get zero of the grants, because they really only operate in the Twin Cities. Anything that is telcom related, broadband, telephone related, Comcast is meeting with the governor, the governor’s staff, the legislators. They have these people that live at the Capitol. The consumer groups like me, we can do a little tiny bit of lobbying, we don’t have the time or capacity. It’s almost a question of whether it’s even worth it because there’s so much to overcome from that power of such a big company like Comcast, that’s only gotten bigger over the years. Mike McIntee: We’re talking with Christopher Mitchell, he’s the director of the Community Broadband Networks Initiative at the Institute for Local Self-Reliance. I’ve got one more question here before we run. That is, if we have our own locally government built internet, does that get rid of the threat of net neutrality? Not the threat of net neutrality but ensure net neutrality, because it’s the large companies like Comcast that we’re worried about that are going to slow down traffic or speed up their own traffic at the expense of other people. Chris Mitchell: I try to be very careful with my words so I wouldn’t say it would ensure that we wouldn’t have it, but we’d be in a better world if we had that there. That’s because the threat of competition would make it less likely that Comcast would do that. I think local governments are almost never going to throttle traffic in that way. One they typically don’t want to, and two if you don’t have the scale of Comcast, advertisers and other ones don’t want to cut deals with you. They don’t want to cut deals with twenty thousand local governments around the country. We have some natural protections if we have local, public owned networks. The final check on that of course is that if a local government builds a network and it starts to operate poorly, you can toss people out and people have lost their jobs around the country when people are unhappy with the municipal network decisions that were made. It’s something that when you have it locally owned by the public, by the local government, you can influence that at the ballot box or through just talking a lot of times with mayors, elected officials, depending on the size of the community. Mike McIntee: Christopher Mitchell, it has been wonderful talking with you. It’s a great fascinating topic. Thank you so much for enlightening us today. I appreciate your time. Chris Mitchell: Absolutely, thank you. Mike McIntee: Okay. We’re going to take a break and then we’ll take more of your phone calls, 952-946-6205. It’s Mike McIntee in here on AM950.